We’d love your help. Let us know what’s wrong with this preview of Inventing Ourselves by Sarah-Jayne Blakemore. The brain creates every feeling, emotion and desire we experience, and stores every one of our memories. And yet, until very recently, scientists believed our brains were fully developed in childhood. Now, thanks to imaging technology that enables us to look inside the living human brain at all ages, we know that this isn’t so – that the brain goes on developing and changi The brain creates every feeling, emotion and desire we experience, and stores every one of our memories. And yet, until very recently, scientists believed our brains were fully developed in childhood. Now, thanks to imaging technology that enables us to look inside the living human brain at all ages, we know that this isn’t so – that the brain goes on developing and changing right through adolescence into adulthood. So what makes the adolescent brain different? What drives the excessive risk-taking or the need for intense friendships common to this age group? Why does an easy child become a challenging teenager? And why is it that many mental illnesses – depression, addiction, schizophrenia – begin during these formative years. Drawing upon her cutting-edge research in her London laboratory, award-winning neuroscientist, Sarah-Jayne Blakemore explains what happens inside the adolescent brain, and what her team’s experiments have revealed about our behaviour, and how we relate to each other and our environment as we ?go through this period of our lives. She shows that while adolescence is a period of vulnerability, it is also a time of enormous creativity – one that should be acknowledged, nurtured and celebrated. To ask other readers questions about Inventing Ourselves, please sign up. This award winning book is written by a Professor of Cognitive Neuroscience at the UCL who specialises in the developing brain of adolescence (defined as the period from the onset of puberty through to when an individual takes a stable, independent role in society). She, along with other researchers, have taken advantage of the use of MRI scans to understand how the brain develops during adolescence (and how it is different to the child and adult brain) as well as looking at a number of small sca This award winning book is written by a Professor of Cognitive Neuroscience at the UCL who specialises in the developing brain of adolescence (defined as the period from the onset of puberty through to when an individual takes a stable, independent role in society). She, along with other researchers, have taken advantage of the use of MRI scans to understand how the brain develops during adolescence (and how it is different to the child and adult brain) as well as looking at a number of small scale social study experiments (similar to those used in lots of Behavioural Economics studies) to identify different behaviours in adolescents in well understood tests and experiments (one example would be the delayed gratification Marshmallow test). Further in some cases these two ideas have been combined in functional MRI scans – looking at brain activity while completing tasks or experiments. In the book these studies are the tentative conclusions with them are discussed in extensive detail, alongside descriptions of the brain, its structure and what we understand of its functioning. The fundamental finding of the studies is that, contrary to beliefs a number of years ago, crucial regions of the human brain continue to develop during adolescence, and in fact that this period is critical to the development of the functioning adult brain (something which is likely connected with most mental illnesses first developing at this stage – albeit the connections are not currently clear). In particular the pre-frontal cortex (responsible for such areas as self-awareness, social interaction, suppression of inappropriate impulse and risk taking, ability to take into account other people’s perspective) is developing significantly over this period – with significant levels of synaptic pruning. Another area that changed during this period is the limbic system – which controls emotion and reward processing, with teenagers particularly sensitive to the rewards of risk taking (at the same time that the pre-frontal cortex’s ability to rationally suppress undue risk is still not fully developed, but the need for peer approval is at its strongest). Risk taking is much more common for adolescents when with their peers due to this developmental mismatch between different areas of the brain. Interestingly for me the author points out that this is corroborated by motor insurance data when young drivers frequency of claims are higher when they have passengers in their cars (which as an aside, not pointed out by the author, also leads to a greater severity of claims due to third party bodily injury claims from passengers, as well as in catastrophic cases the potential for huge future care or loss of earnings claims). I have seen elsewhere that the author tentatively supports ideas to ban young drivers from carrying passengers of a similar age. The book’s strength is simultaneously its weakness. Professor Blakemore resists strongly the temptation to draw overly certain conclusions and specifically in a penultimate chapter cautions against much of the popular science which likes to produce headline results around neuroscience and translate them into easy to apply ideas for education or brain training. She points out here, but also regularly in discussing the work of her own lab (and others with which she collaborates) the limitations of much of the current research: many results have not been independently replicated; the relatively recent innovation of MRI scanning means that there is an absence of longitudinal studies; the cost of MRI scans leads to issues of statistical validity - sample sizes are typically very small and there is very limited opportunity to look for factor interactions; these issues plus ethical ones make randomized control trials (let alone blind or double-blind ones) difficult. But of course the very scientific honest and transparency of these limitations, mean that Professor Blakemore does not supply a list of ready conclusions or recommendations for parents (or teachers) of adolescents. Her overwhelming conclusion here I believe is that adolescence is a vital part of brain development – and that most (if not all) of the behaviours we see (and often castigate) as typical teenage ones are crucial to this development and should be respected for what they are, while channeled as much as possible. The very nerve centre of the human body is the brain. Its input is our senses, the memory helps us to learn from mistakes and controls the reactions that are needed. For hundreds of years, the brain has been a mystery to all that studied it, but only in the past few decades have we begun to scratch the surface of its capabilities. Even that is unravelling; those that thought as puberty begun, the human brain was developed have been proved wrong. The brain continues to change and adapt all throug The very nerve centre of the human body is the brain. Its input is our senses, the memory helps us to learn from mistakes and controls the reactions that are needed. For hundreds of years, the brain has been a mystery to all that studied it, but only in the past few decades have we begun to scratch the surface of its capabilities. Even that is unravelling; those that thought as puberty begun, the human brain was developed have been proved wrong. The brain continues to change and adapt all through the teenage years and into adulthood. In this excellent book on why the teenage brain is different, Sarah-Jayne Blakemore, professor in cognitive neuroscience at University College London takes us into the untidy spaces within their heads to share the latest details of what is going on. From her experiments that her team have in researching the brain we will learn about why they take risks, why some friendships can be so intense, why some behave badly and others won't talk. This time of our lives is when we can enormously creative and also destructive, a lot of mental health issues raise their head for the first time ever in teenagers. 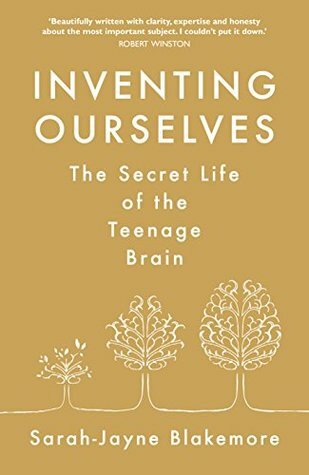 There was so much to enjoy in this book because it was easy to read and understand- it seems like Blakemore truly wants people to understand that adolescence is a unique time for brain functionality and development by giving examples that illustrate her point. While plenty of the experiments were done by her and colleagues, she references plenty of others and shares that there is just so much more to learn and know. For the most part, they blend in well with her narrative and demonstrate her poin There was so much to enjoy in this book because it was easy to read and understand- it seems like Blakemore truly wants people to understand that adolescence is a unique time for brain functionality and development by giving examples that illustrate her point. While plenty of the experiments were done by her and colleagues, she references plenty of others and shares that there is just so much more to learn and know. For the most part, they blend in well with her narrative and demonstrate her point without overwhelming readers and losing the overall message of patience and science in knowing teenagers. Yes she’s English but references Western culture in general while taking into consideration culture and language from across the world. Довольно неплохая, относительно узконаправленная книга по психологии, затрагивающая главным образом подростковую психологию. Особо я бы отметил тему «подростки и их социальное окружение», т.к. эта тема, лично для меня, оказалась новой и интересной, т.е. я ещё не встречал ту информацию, что была использована автором. Можно сказать, что это главная причина высокой оценки. Что же касается причин, по которым я не поставил книге высший бал, то они довольно простые: сложность текста (местами) и расфок Довольно неплохая, относительно узконаправленная книга по психологии, затрагивающая главным образом подростковую психологию. Особо я бы отметил тему «подростки и их социальное окружение», т.к. эта тема, лично для меня, оказалась новой и интересной, т.е. я ещё не встречал ту информацию, что была использована автором. Можно сказать, что это главная причина высокой оценки. Что же касается причин, по которым я не поставил книге высший бал, то они довольно простые: сложность текста (местами) и расфокусированность. Вечные причины моего неудовольствия к большинству книг. Во-первых, в тех моментах, где автор начинает углубляться в физическое строение мозга, текст довольно сложный, т.е. как в привычных академических учебниках по психологии. Тут уже трудно переваривать информацию, в особенности, если это аудиокнига. И вдвойне это справедливо, если текст написан не на родном для тебя языке. Так что местами книга по-настоящему тяжела. Во-вторых, автор часто отклоняется от основной темы. Например, когда пишет о психических болезнях типа шизофрении или о детской психологии или о работе мозга в целом. Лично я не нашёл чёткой связи между серьёзными расстройствами и подростковой психологии. Мне кажется, эту тему не стоило включать в книгу, даже несмотря на то, что ей посвящается крайне небольшое количество текста, ибо всё равно это сбивает с главной темы. Что же касается детской психологии, которой автор уделяет довольно много внимания, то тут может возникнуть возражение, что мол, детская психология, она как бы и не очень далека от подростковой и возможно даже, крепко с ней связана и именно поэтому невозможно обойтись без её включения. Возможно. Но я всё же не соглашусь с данным утверждением. Всё же все эти истории, эксперименты с зефиром и пр., не кажутся мне такими обязательными при объяснении подростковой психологии. Что же касается более отдалённых тем, что были включены автором, а точнее о важности и умения считывать информацию (эмоции) с человеческого лица, а также та стадия, на которой начинается понимание или осознание, что у другого человека есть собственные мысли и собственные желания (как-то так…), не видятся мне строго связанными с подростковой психологией. Либо я не подметил строгую связь одной темы с другой (подростковой психологией). Ну, и, разумеется, тема работы мозга как таковая, тем более не кажется мне уместной в данной книге. Т.е. когда автор пишет о том, что определённые отделы мозга напрямую связаны со способностью запоминать (долговременная и кратковременная память), способность сохранять хладнокровие (держать себя в руках, не быть чрезмерно вспыльчивым), распознавать лица и так далее. Всё же эта тема хоть и важна, однако она появляется чуть ли не в каждой третьей книге по психологии. Или, возможно, у автора не очень удачно получилось сжато передать её, если автор считает это так необходимым для полного понимания подростковой психологи. Несмотря на то, что я уделил много внимания отрицательным моментам, книга, тем не менее, оставляет в целом положительные впечатления. В особенности книга понравится тем, кто редко читает что-то из разряда «психология», т.к. главной особенностью книги является огромное количество различных экспериментов, которые описывает автор. Т.е. это настоящая научная работа по подростковой психологии, где каждое утверждение сопровождается несколькими экспериментами. А также имеет довольно подробный анализ подростковой психологии, включая даже такие темы как воздействие алкоголя, видео игр, марихуаны и пр. на подростков. Также интересным представляется ситуация более рискованного поведения подростков по сравнению с взрослыми. А так же почему бессмысленно или малоэффективно пугать подростков долгосрочными последствиями вредных привычек. Inventing Ourselves by Sarah-Jayne Blakemore is an excellent basic neuroscience primer for people with a little exposure to topic. On the surface it may seem a little daunting due to the amount of research that is cited for the lay person but Blakemore makes the information accessible to anyone that is interested in the subject by not over using neuroscience jargon and clearly defining all terms that are needed. The book gives you a good overall view of the subject by devoting its first few chap Inventing Ourselves by Sarah-Jayne Blakemore is an excellent basic neuroscience primer for people with a little exposure to topic. On the surface it may seem a little daunting due to the amount of research that is cited for the lay person but Blakemore makes the information accessible to anyone that is interested in the subject by not over using neuroscience jargon and clearly defining all terms that are needed. 2)	The type of marketing and messages that teenagers are more likely to respond to based on the fact that they are less impacted by fear of adverse consequences than adults. 3)	The research on how brains develop differently in people with different mental conditions like schizophrenia, depression, anxiety, etc. 4)	The effects of sleep deprivation on teenager’s brains. 5)	Possible improvements that could be made to our educational system based on their specific developmental needs. In short, this book is an excellent resource for parents frantically trying to understand their children, educators, other professions that deal with teenagers, or to those interested in neuroscience. The author is very knowledgeable and takes a compassionate view of people going through the formative period of life. This is a very informative non fiction novel on the adolescent brain. However it is academic in tone and it discusses and references an exhaustive list of clinical studies and trials which makes the reading experience a trifle tedious. Listening to this on audiobook also was difficult as at points I got distracted and lost the thread. Overall an interesting book that is up to date on research and had some fascinating truths to express around adolescent and adult brains and brain development. There's some really good information in this book, but it's a little hard to read. Award-winning neuroscientist Sarah-Jayne Blakemore explains the developmental journey our brains take during adolescence and how the experience of these years determines the adults we become. Risk taking, intense relationships, going to bed and getting up late--what is going on in teenagers' brains? Until very recently, we believed that the human brain stopped developing in childhood--that by the time you reached adolescence, your brain was fully developed. In Inventing Ourselves, award-winning neuroscientist Sarah-Jayne Blakemore reveals that this is simply not the case. Blakemore shows that there are fundamental differences between the adult and adolescent brain, and typical teenage behavior is caused by the transformations that take place during this formative period. Perhaps unsurprisingly, these physiological changes are most evident in the prefrontal cortex, the region responsible for decision-making, planning, inhibiting inappropriate behavior, evaluating risk, and understanding others. With implications for education, parenting, and treating mental health conditions, Inventing Ourselves will transform the way we think about adolescence and reveal that the changes we experience throughout our teenage years dictate the adults we become. This is a great book for anyone who works with teenagers. basically it looks at all the research about adolescent brain development and highlights the reality that the teenage brain is not fully developed yet and so it operates in a way that is different from an adult's. For this reason we need to accept that this places some limitations and difficulties on an adolescent which we probably need to take into consideration if we are to avoid getting really frustrated. Well written and easy to follo This is a great book for anyone who works with teenagers. basically it looks at all the research about adolescent brain development and highlights the reality that the teenage brain is not fully developed yet and so it operates in a way that is different from an adult's. For this reason we need to accept that this places some limitations and difficulties on an adolescent which we probably need to take into consideration if we are to avoid getting really frustrated. Interesting and informative, although does show how little we know. Highlights reasons as to why all science seems to change week to week, but the author give s a candid account, bit going too deep into the detail. Not something I would read out of choice, just trying to push myself out of the box a little, so whilst it may not have been my cup of tea, I did find it informative. It was chosen based on a Radio 4 programme I listened to a few weeks ago, I also have a different book from the same pr Interesting and informative, although does show how little we know. Highlights reasons as to why all science seems to change week to week, but the author give s a candid account, bit going too deep into the detail. IF you are planning on having children or already have them and they haven't progressed to adolescence (or even if they're in the throes of teenagedom) you need to read this book. You need to realize that teenagers aren't behaving the way they are because they're mean - they're just insolent. So, why does my teenage sleep so much? - the author delves into the reasons and provides you with the answers (there are a few). How can I get my teenager to adopt a more sensible view to life and avoid the IF you are planning on having children or already have them and they haven't progressed to adolescence (or even if they're in the throes of teenagedom) you need to read this book. Advances in PET and fMRI have made it possible to map from where in our brains our thoughts arise. I’m not entirely sure how that information is useful, though I suppose it’s interesting. Even more interesting is seeing how those regions of the brain change as one passes through adolescence. If you are keen to know what region of their brain your teenager is using as they ___________, then this is the book for you. Professor Sarah-Jayne Blakemore, a world leader on research about the adolescent brain discusses what is going on in the teenage brain. Her research has confirmed that the brain goes on developing and changing throughout adolescence. What was reaffirmed for me: teens will take more risks when with other teens, teens need more sleep than adults, the teenage brain is "plastic" and is not fully developed until later in the twenties. I loved her TedTalk about the teenage brain and was looking forward to more detail and more engagement. Instead I got a mix of total boredom and condescending explanations and repetitious circular research applications. Sorry, Sarah Jayne, this book did not transfer well. Wish everyone could read this book. It enlightening in the sense that it affirms and dispels myths and common knowledge about adolescence. A must for parents, educators, policy makers and anyone interested in understanding the youth. It gets a little dense towards the middle. Excellent combination of clear explanations backed by valid scientific research and evidence. In addition, Blakemore is diligent about what studies mean and what they cannot explain. There is so much disinformation, it is refreshing to have an accurate view of current research in generational brain development. Not a huge number of surprises - but interesting to see how research is starting to back things that we might expect. Was very interested in the discussion of the marshmallow test and the impact of trust within this. Brilliantly written even for a lay-person to understand. Loved the explanations and examples even if sometimes a bit repetitive. Excellent insight on why we should be more patient with our teenagers. Probably easier to listen on audio than read. Naratition was wonderful. I wish I had read her book about education instead of this one, but I didn't know it existed. Oh well. Some good, interesting stuff in this book. Some things that I will be able to incorporate into my teaching and parenting. I received this as a Goodreads give away. So good I shared it with my colleagues. I only give 5 stars for what I call 'life changing books' or books that really alter my thinking in some way. This book is definitely one of them. Fascinating research about the teenage brain combined with accessible, yet careful writing. It really helps to give a basis of understanding about why teenagers behave and think the way they do. I particularly valued Blakemore's thoughts and views on the history and state of neuroscience research - cautioning against making too many assumptions about I only give 5 stars for what I call 'life changing books' or books that really alter my thinking in some way. This book is definitely one of them. Fascinating research about the teenage brain combined with accessible, yet careful writing. It really helps to give a basis of understanding about why teenagers behave and think the way they do. I particularly valued Blakemore's thoughts and views on the history and state of neuroscience research - cautioning against making too many assumptions about findings and how scientists' thinking on the teenage brain has changed so much in just the past 1-2 decades. Very easy to read, but clearly based on research which is explained well and consistently put into context. Really fascinating and engaging book!